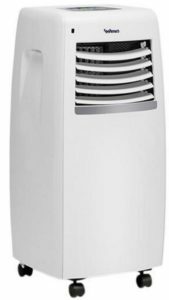 The Comfee Mobile Air Conditioner 9,000 BTUs / h is ideal for those who want to have small air-conditioned environments, without works. With wheels in the base and handles that facilitate the transport, the product comes with installation kit, dispensing specialized workmanship in the installation. It is environmentally friendly because it uses R410-A refrigerant, which does not damage the Ozone Layer and has several functions that help make your environment much more comfortable.